Melchizedek’s name is said to mean “king of righteousness” or “genuine or rightful king.” He was a Canaanite priest-king of Salem now known as Jerusalem) and was a teacher of Abraham. Ancient mystical texts describe him as one who conducts spirit releasement on a massive scale, working in conjunction with Archangel Michael. Descriptions of Melchizedek’s history are conflicting. In the Dead Sea Scrolls, he’s called Michael, and there’s some allusion to Melchizedek being one and the same with Archangel Michael and Jesus. This latter speculation is echoed by Apostle Paul’s letters to the Hebrews, in which Paul discusses Melchizedek and Jesus as both being great high priests, and that Melchizedek was a foreshadowing to Jesus’ appearance on Earth. The Eastern spiritual text Nag Hammadi also discusses Melchizedek as being a past incarnation of Jesus Christ. According to The Book of Enoch, Melchizedek was the child of Noah’s brother, Nir. Nir’s wife died before giving birth, and Melchizedek was delivered posthumously from his mother’s womb. However, there’s other speculation that he’s actually Noah’s son Shem. It is said that Melchizedek made the first offering of bread and wine to Abraham for his military victory. He’s even depicted as holding a cup or chalice in a stone sculpture from the Chartres Cathedral in France. Saint Paul spoke of Jesus Christ as a priest according to the order of (or in the succession of) Melchizedek because Jesus later instituted the use of bread and wine in the Eucharistic sacrifice at the Last Supper. The Council of Trent even discussed Melchizedek offering bread and wine, and then Jesus instituting it at the Last Supper. 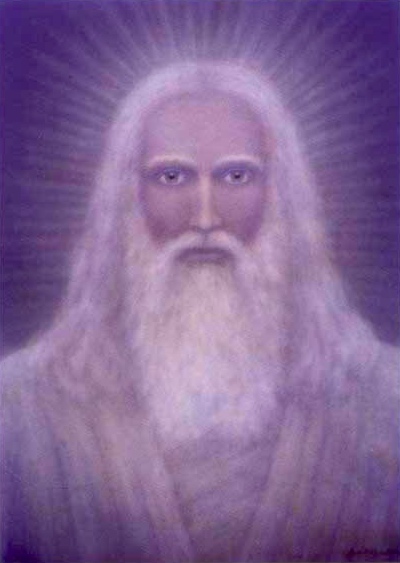 When I called upon Melchizedek, an extremely tall man with piercing blue eyes appeared before me. He showed me that he oversees a switching station into which stream various colors of the rainbow. These hues are the energies of universal vibrations, given off by everything: the planets and stars; organizations; and thoughts and emotions. Melchizedek said: “I am part of the regulating program that balances and harmonizes all energies. These energies are flowing continuously, and they form the basic structure of the universe. All substances are formulated from these agents. All atomic particles revolve around them, too. So, to rearrange the substance of some situation, you must call upon the internal colors to rearrange it so that differing amounts of those colors exist, and the order in which they appear is changed. Melchizedek showed me how his regulatory system could instantly rearrange and reorganize matter by remixing its energy color components. This could be used to undo a negative situation, to increase flow and supply, and to create or attract new substances or situations.